Our main family celebration of the year is not Christmas but Winter Solstice. As a secular family, we have been celebrating Solstice for some 15 years, since our first born was just a baby. Many of our current customs date back to this tentative start at creating our own meaningful family celebrations, and each year we tweak and refine the to suit our evolving needs and desires. For years I have fielded questions about how we celebrate – questions from other parents who are looking to create their own treasured family rituals. It seems we're not alone in seeking out meaningful traditions for our family! The longest night and shortest day are a wonderful time for us to slow down, gather together as a family, and focus in on what matters to us most. Into the darkness we bring all the light that we can – both literally and figuratively. Each Solstice celebration is a bit different than the ones before, but our traditions always center around flickering flames, family, and connection, and takes place on the day before Winter Solstice, or Solstice Eve (we normally celebrate on either December 20 or 21). We exchange handmade gifts as well, but they are a small part of our day, rather than the central feature. Indeed, our celebration is made of so much more than presents! Folded paper window stars are simple to make and beautiful to behold. We display them in nearly every window of the house, where they catch the fleeting sunlight. If you've never made window stars, be prepared to be as addicted as your kids! This book offers simple, easy instructions. Cut-paper snowflakes are another option, though with a bit more clean-up and slightly less pizazz. Several years ago we foraged a bagful of giant pinecones from a road trip down south. They are perfect for making pinecone bird feeders, though small local red pine cones are lovely as well. Every year we spread some pine cones with nut butter, then roll them in bird seed and hang up outside the kitchen window as a Solstice gift for the birds. Because Solstice is a celebration of fire and light on this darkest day of the year, we always make candles for the coming year on Solstice Eve. Rolled beeswax candles made from flat wax sheets are easiest for younger kids – and fun for even adults – but this year we're returning to our tradition of dipping beeswax candles and making beeswax candle luminaries once more. Aside from making, Solstice Night is full of family time. Games, books, songs, and stories are all part of our celebration. Because my kids are getting older, read-alouds don't play the part they once did. I still occasionally manage to pull and old favorite off the shelf to read on Solstice. Our favorite seasonal books include The Shortest Day, The Return of the Light, and classic winter tales like Ollie's Ski Trip, The Sun Egg, It's Snowing, The Tomten, and The Big Snow. Getting outside is an almost non-negotiable piece of our Solstice celebration. A hike, ski, snowshoe, or sledding adventure is just the thing to celebrate the longest night! 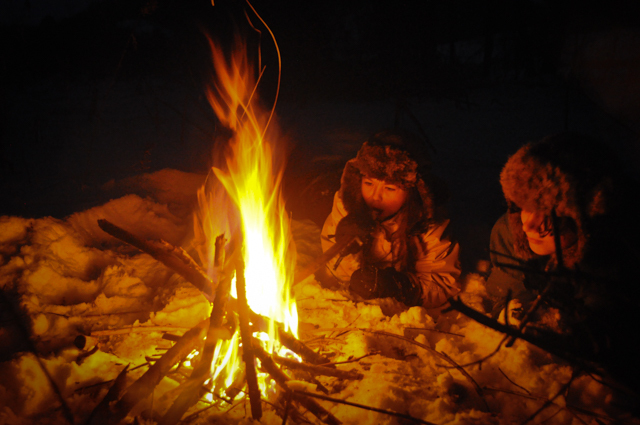 Being a fire celebration, each Solstice night at sunset we bundle up and head to the woods to light a campfire in the snow. This is, quite possibly, my favorite part of the night. We drink tea or eggnog as the fire crackles and the sun sets, make a wish for the coming year on a stick or leaf we each toss in the fire, the walk home through the dark woods (no headlamps!) to a warm house and dinner by candlelight. Inspired by a Martin and Sylva story on Sparkle Stories, we recently began a tradition of an all local dinner on Solstice night. Homegrown chicken, duck, or quail; butternut squash from a friend's garden; milk and cheese from a cow we know by name; kale from a nearby farm. We live in an area rich beyond belief in local food, making our celebratory meal that much more delightful to put together. Because, yes, there are gifts! They just aren't the main focus of our celebration. Our gifts are small and usually handmade – from freezer paper stenciled t-shirts to homemade aprons to handmade caramels. Occasionally something larger finds its way in (like a knitted sweater) but usually smaller is better in our world. 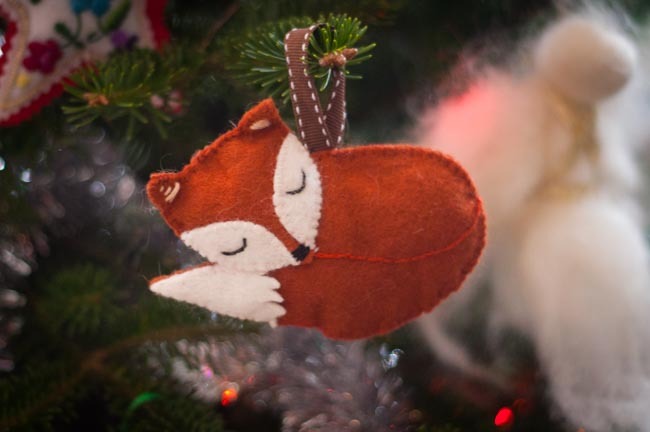 I make each of the kids three small gifts each year, and one is always a handmade ornament for the Solstice tree. My grandma made my sister and I each a collection of beaded and embroidered ornaments when we were kids that I treasure to this day, so I adopted this craft as an annual tradition in our family. One of the favorite parts of our Solstice celebration when the kids were young was to stay up as late as we wished (or, as the family rule went, "all night, or until someone loses their mind"). Very loosely based on the Pagan tradition of keeping vigil by the fire throughout the longest night, then celebrating with the rising sun (but minus the Pagan bit), we decided that Solstice was a good reason to treat the kids to a wildly late bedtime once a year. When the sun rises on Winter Solstice Day, we celebrate by pulling our Solstice Sun from the starry sky envelope, and hanging it in the window. We made it through the longest night, and from here the sun grows stronger and the days grow longer. We think that's something worth celebrating. (I made the sun a decade or so ago using an easy-to cut and emboss metal tooling kit, but I've always wanted to remake it with wool felt. Wishing you all much light and magic during these dark winter days! This was the coolest read!!! Really enjoyed it!